Currently, the Comedo Diamond Microdermabrasion Machine is a Best Seller on Amazon, so customers clearly like the results they can achieve using this system. It is designed to offer a non-surgical solution for people with dull looking skin due to a build up of dirt, debris and dead skin cells. This microdermabrasion machine is suitable for anyone who has large pores, rough skin, mild pigmentation problems, blackheads and mild acne . It uses a diamond tip and an adjustable suction strength to gently remove all of the debris from the top layer of your skin, cleaning your pores and revealing the beautiful, clean skin underneath. Helps to tighten and lift the skin on your face and neck. Reduces the build of of grease on your skin. Deeply cleans the cells of your face and neck. 4 different probes for maximum exfoliation. 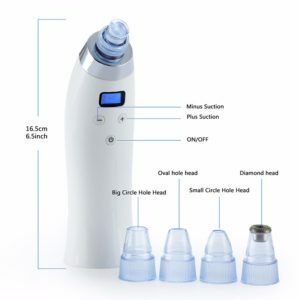 How do you use this diamond microdermabrasion machine? This is a cordless microdermabrasion machine, so it is very easy to use and since it is recharged using s USB charger (2 hours recharging time), it is great for traveling and is very light weight and portable. Most customers find that they have at least 5 or 6 full exfoliations before it needs to be recharged. Diamond head: This is the probe that you actually use to exfoliate your skin and it works well. The problem however is that I can’t find anywhere you can buy new diamond heads, because every diamond tip wears down and needs replacing over time. Large circular probe: This probe gives you the greatest suction and is perfect for reducing the amount of grease in your skin and for removing blackheads. Small circular probe: This provides weaker suction than the larger sized probe and is suitable for removing small surface blackheads or blemishes, and for sensitive skin. Oval probe: The function of this probe is unclear, but it appears to be suitable for hard to access areas around the nose and mouth of your face. 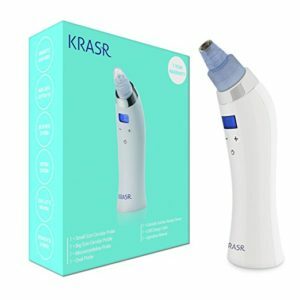 I really wanted to like this diamond microdermabrasion machine by KRASR, but there are too many conflicting reviews, even though it is a Best Seller on Amazon. It does come with 4 different heads (1 diamond tip and 3 suction heads) and it is rechargeable and easily portable. However, when you can’t read the instructions properly and you can’t buy new diamond tips, then is it really worth the price? No-one wants to buy another entire unit, just because they need a new diamond tip – as these tips do wear out after time. With clear instructions and the ability to purchase more diamond tips, I would give this microdermabrasion machine a much better score.